Check Rates & Availability at Super 8 Pinetop! Welcome to the Pinetop Super 8 Enjoy convenient access to a variety of outdoor activities such as skiing, hunting, golfing, fishing and hiking while staying at this charming Pinetop, Arizona hotel. 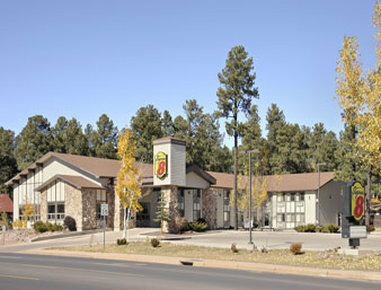 Located in central Arizona's Apache National Forest, the Super 8 of Pinetop offers upgraded amenities and friendly customer service at an affordable rate. Each of the 42 well-appointed guest rooms and suites at this Pinetop hotel features a microwave, refrigerator, cable satellite television with HBO and free wireless high-speed Internet access. Start each morning off with a delicious complimentary Superstart breakfast before taking advantage the hotel amenities such as an indoor heated Pool and Jacuzzi spa and a lobby business center. Take a short walk into downtown Pinetop to enjoy a leisurely afternoon of boutique shopping, dining at local restaurants or browsing local businesses. Ski buffs will enjoy convenient access to Sunrise Park Resort offering great slopes for both skiers and snow boarders. The Pinetop area offers a variety of other outdoor activities such as horseback riding, golfing at Torrean Golf Course and Silver Creek Golf Course, fishing on Rainbow Lake, hiking and hunting. Guests staying at the Super 8 of Pinetop will also enjoy taking a short day trip to the beautiful Petrified Forest National Park and the Painted Desert, only 50 miles away. Pinetop hosts an array of events throughout the year including the Pines Car Show, the Woodland Holiday Lighting Festival, the Bluegrass Festival and numerous Native American ceremonies. The friendly, helpful staff at the Super 8 invite you to a Super stay and a full-filled memorable stay in Pinetop, Arizona. Make a reservation today and save. Pets are welcome for a 25.00 charge per stay.